IN BRIEF: More earthly than spacey. I’ve a confession to make. It’s not a scandalous or even terribly shocking one, but I must admit it is rather embarrassing on my part. 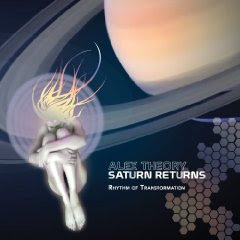 You see, this here album titled Saturn Returns by San Francisco-based Alex Theory was a blind purchase -as in, I picked this up with no prior knowledge of the artist, and without hearing a few samples in-store. This of itself may seem a little peculiar to many of the MP3 generation - “you bought music without even knowing what it was! ?” - but has been a common practice amongst dedicated music buyers for years. There’s a measure of thrill in making blind purchases, a giddy feeling that mere luck and chance has directed you towards this previously undiscovered treasure of sonic gold; or, the fates have been unkind, and your money has been wasted on a release that will collect dust on your shelf, a few token sympathy plays notwithstanding. Ultimately, it’s a similar thrill that anyone who’s gambled on something can relate to. I should make it clear that, as a whole, I don’t find New Age mysticism all that bad. Really, many of the people involved are perfectly pleasant folks, if at times a bit flighty in conversation. That said, much of the music associated with it isn’t terribly engaging, which is often the point; when you’re in deep meditation, you want music to merely supply a mood and serve as wall-paper to your surroundings, not to directly grab your attention. Unfortunately, this makes much of it rather ‘muzaky’ in the process, which is utterly wretched to have to listen to when you do focus on it. So yes, it was rather petty of me to assume that this was what I was in for with Alex Theory. Still, if this was to be the case, why was he in the ‘electronica’ section of the store and not the ‘New Age’ section instead? A misfiling, perhaps? Or maybe I should have just checked my preconceived notions at the door because had I actually known who Alex Theory was, I’d have never made them in the first place. Oh, he definitely skews towards the mystical side of music, as his association with the Discover Sound collective attests to; however, his actual output has more in common with world-fusion dub-funk than anything New Age. It’s the kind of stuff you might expect on a Buddah-Bar compilation or a Bill Laswell project (though with less emphasis on bass), and, to be frank, incredibly common where chill-out music is concerned. Theory is a good musician but he’s travelling well-trodden roads here. Ethnic samples, rhythms, harmonizes, and so on are all skillfully woven together, creating a blissy atmosphere with just enough drum programming to entice a little hip-shake should you be up for it. Yet, he never really pushes the envelope in the process, nor throws in musical twists or production curve-balls to spice up the proceedings. Instead, he simply allows his beats and melodies to do the work, with just enough flourish to keep you engaged should you pay more diligent attention to it. About the most notable wrinkle he brings is differing time-signatures, yet even they won’t dazzle many. It’s all very nice to listen to; unfortunately, when other musicians in this field go out of their way to be unique or experimental, Theory ends up sounding rather tame and safe as a result. Much of Saturn Returns strikes me as something Ott would write before he throws his tracks into a psychedelic soup. Where this album does shine, however, is whenever Theory brings in a little collaborative help, much of which appears in the second half. Famed didgeridoo player Ganja Giri does his thing in Event Horizon, and Theory provides suitably bottom-heavy beats for him to play off of. Elsewhere, keyboardist Andrew West throws in a wonderful solo for the jazzier Moon Song and Saturn Returns, which are superb. Theory himself also provides guitar and keyboard solos on other tracks, but he seems more adapt at playing off of others. Granted, if you aren’t one for jazzy solos, then you probably won’t vibe on these -too bad, then. Overall, Theory’s album is good for a casual throw-on, and shows promise in future releases. Still, despite little to find fault in with the music, he needs to do more in order to stand out from the glut. Perhaps more collaboration is in order, hm? Written by Sykonee, 2009.© All rights reserved. RipFork, a music writer's greatest annoyance.